Saturday night Victoria and I had stayed at her aunt’s house in Sussex, which makes it a little easier with a day game after a night game. We left the house at 10:00, got some breakfast, and then headed to Miller Park. We were parked at 11:25 and went to the bus parking to meet up with some people from Fort. They had brought a bus from Fort Atkinson to celebrate a friend from high school’s birthday (Justin). I played a game of bags (which I won), had a few beers (which I drank), and then decided it was time to head inside. It was really hot (again) and Victoria and I agreed that we probably wouldn’t be watching much of the game from our seats. 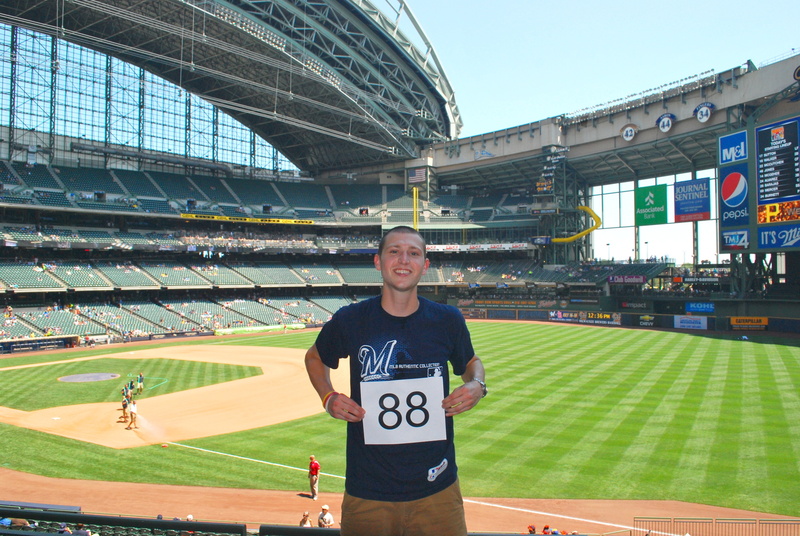 We got inside at 12:30 and went to section 209 to get game photo number 88. As these numbers get bigger the number of days become fewer that I have until I’ll have to rejoin the workforce and figure out what I want to do with my life. I’m a procrastinator so I’m really hoping the season lasts longer than 162, for more reasons than one. Victoria and I went down by section 111 and watched the first four innings from the concourse. On Sundays the Brewers usually make nine kids extremely happy with the Major League Moment. Lucky winners (you have to register at PNC banks) get to join the Brewers for the national anthem at their position on the field. This Sunday was family day, so there were more than just nine, and it was most all of the active players’ kids, as well as Craig Counsell’s kids. It was pretty cool, and Yovani Gallardo got to stand with his son (Yovani Jr.). Here they are just before Yovani Jr. left the mound. 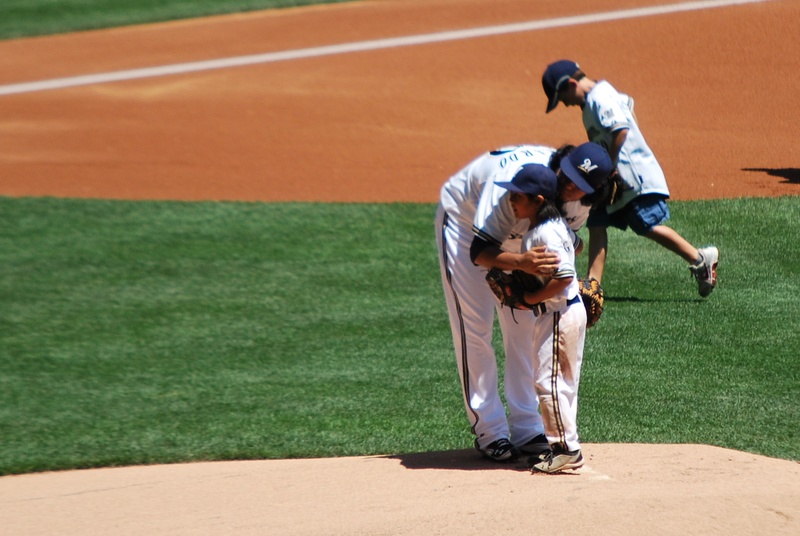 You can tell that Yovani Jr. had been sliding on the infield before the game because his pants are pretty dirty. I suspect having a major leaguer as a parent has its drawbacks (not seeing much of them for 7 months of the year), but there are also times when it’s got to be pretty cool. Aoki was batting leadoff and the first pitch he saw in the bottom of the first was hit down the right field line for a double. Nyjer Morgan was up next and he executed a perfect sacrifice bunt, getting Aoki to third base with less than two outs. With that lead-up you’d think the Brewers scored at least one run in the inning. Spoiler alert; they did not. Braun went down looking at strike three and Aramis Ramirez struck out swinging to end the frame. In the top of the second Casey McGehee grounded one up the middle that was fielded by recent call up Jeff Bianchi (pronounced “BE – YANKEE”). 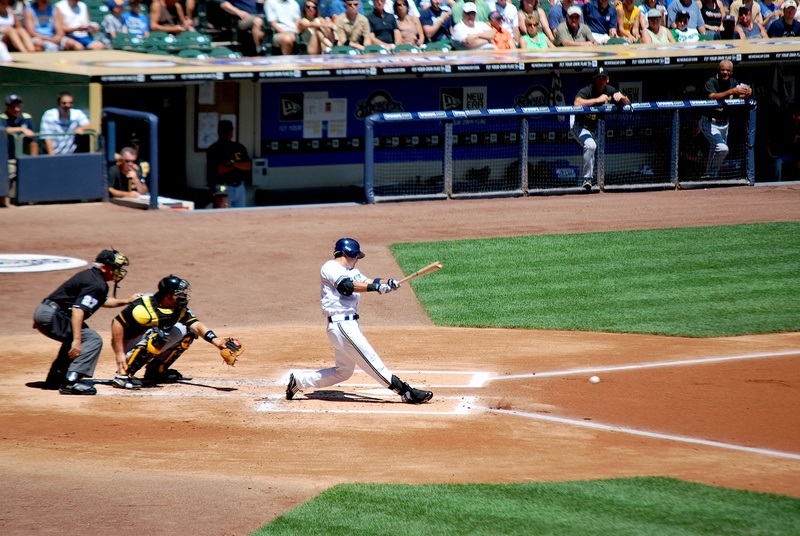 He fielded it near the second base bag and threw on the run to retire the former Brewer. I like that he’s airborne, you can see his shadow and the shadow of the baseball. 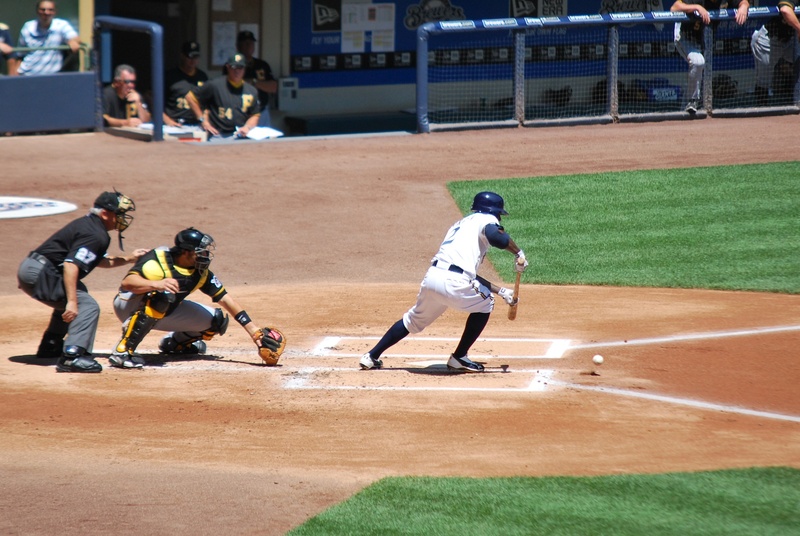 It remained scoreless until the top of the fourth, when MVP-candidate Andrew McCutchen hit his third home run in as many games. He went three for four and has his batting average up to .371. He’s having a great season and he’s fun to watch. Now if only he could somehow find his way onto the Brewers roster I could speak even more highly of him. 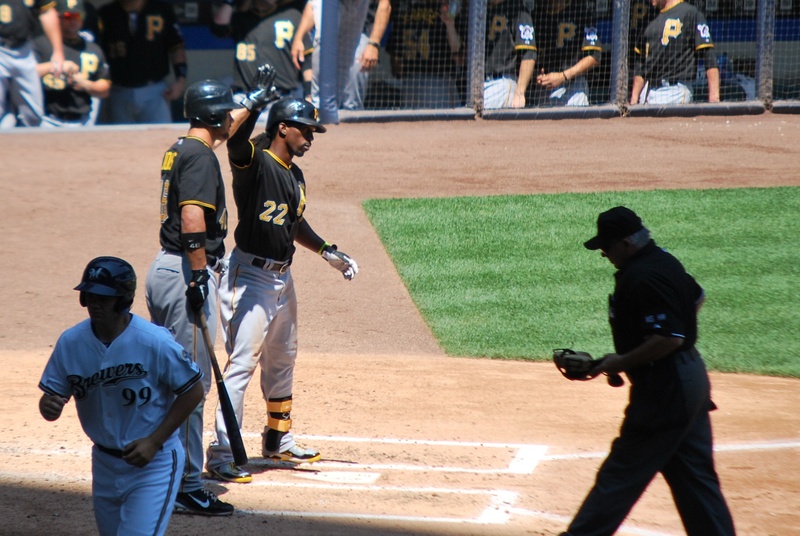 Here’s McCutchen (22) after touching home plate and giving the Pirates a 1-0 lead. After the top of the fourth inning Victoria and I headed back up to the loge level. I went down and stood in front of the press box while Victoria went and got some nachos. We devoured them and agreed that they’re one of the best things to eat at Miller Park, if not THE best. I might still have to lean towards the Polish topped with caramelized onions, but it’s close. 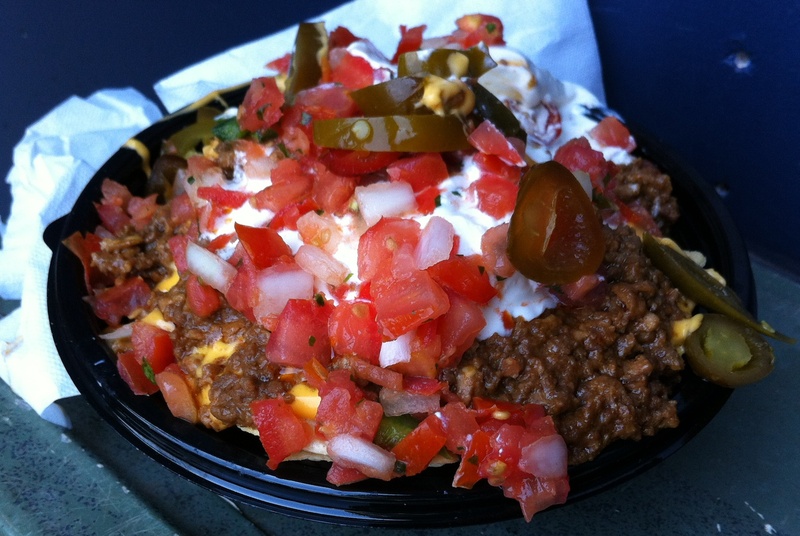 The nachos were messy and magnifilicious at the same time. The fact that we couldn’t see a single chip was a good indication the nachos were going to be messy. 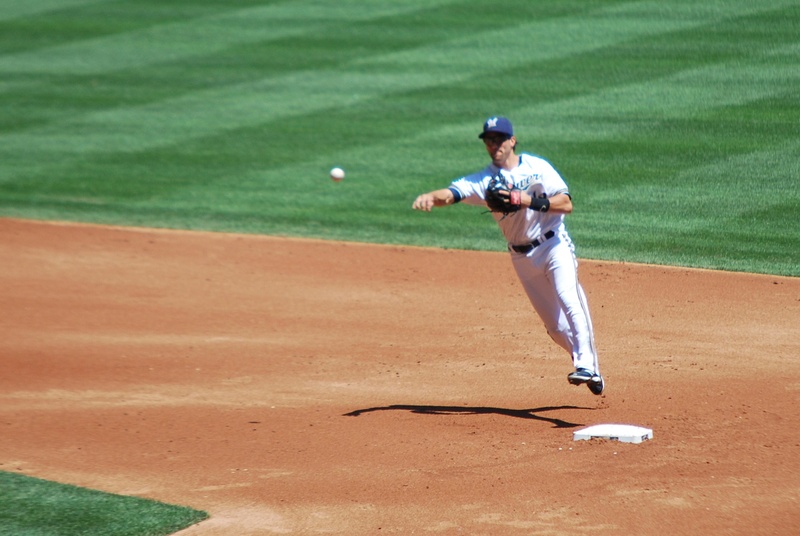 Braun was able to go all the way to third base due to the off-line throw from Jones. 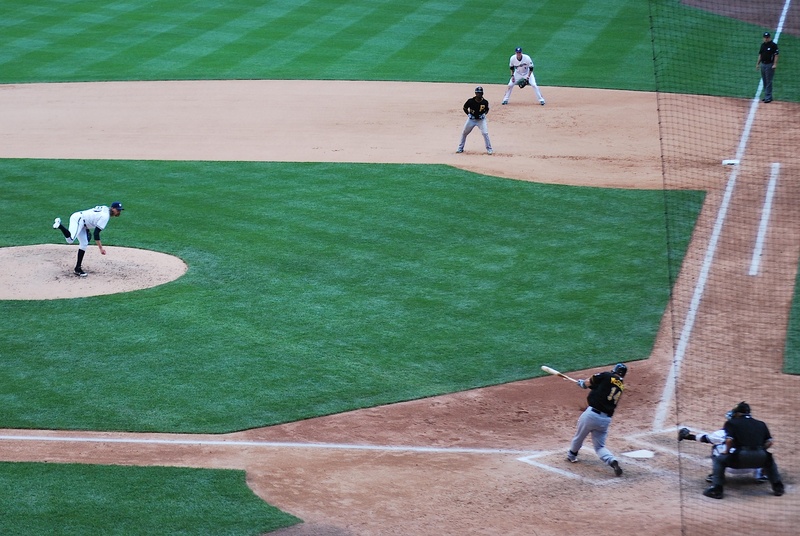 The Pirates brought the infield in to try and keep the Brewers from taking the lead. 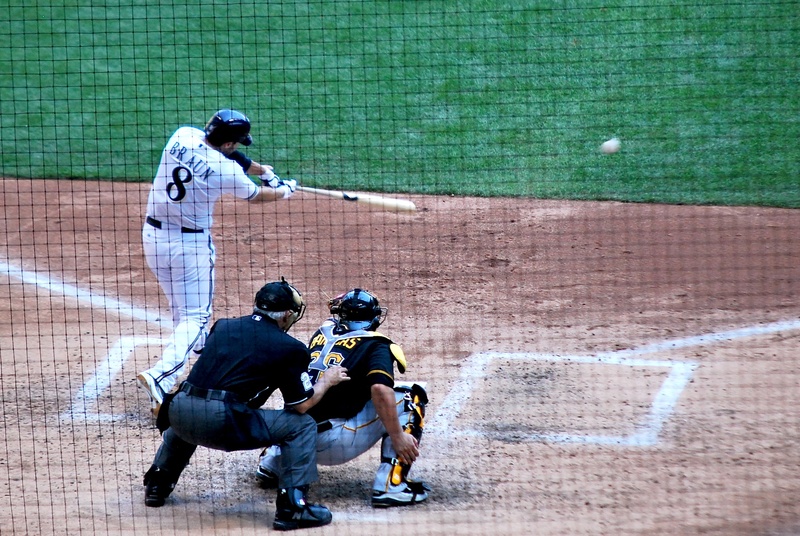 Aramis Ramirez, however, got the job done and hit one up the middle to score Braun. After a Corey Hart strikeout Rickie Weeks and Martín Maldonado both doubled, increasing the lead to 4-1. 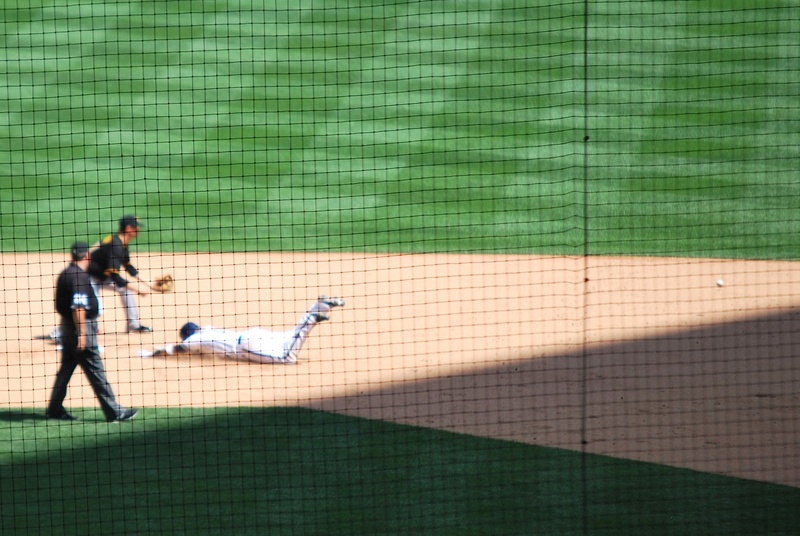 Maldonado’s double resulted in a close play at second. 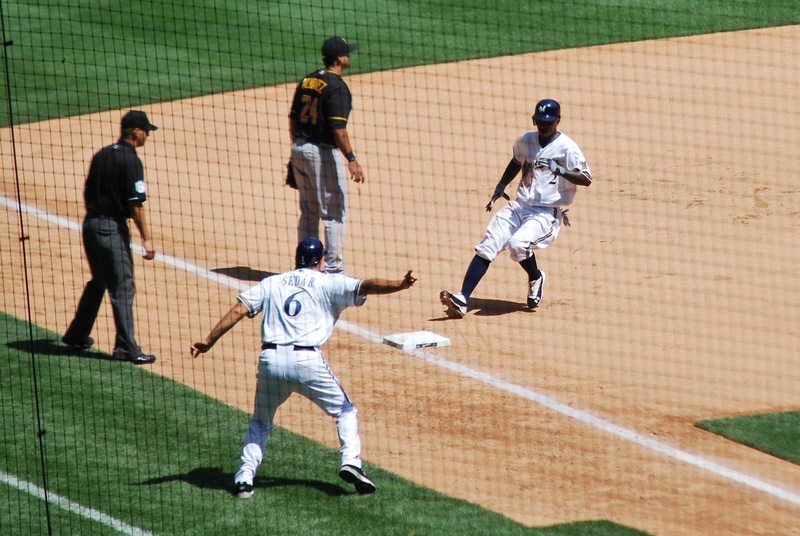 Here he is sliding/belly-flopping into second base. You can see the ball on the right side of the photo. I know it’s not the clearest picture (I think my camera focused on the screen) but I thought it was still funny/cool. 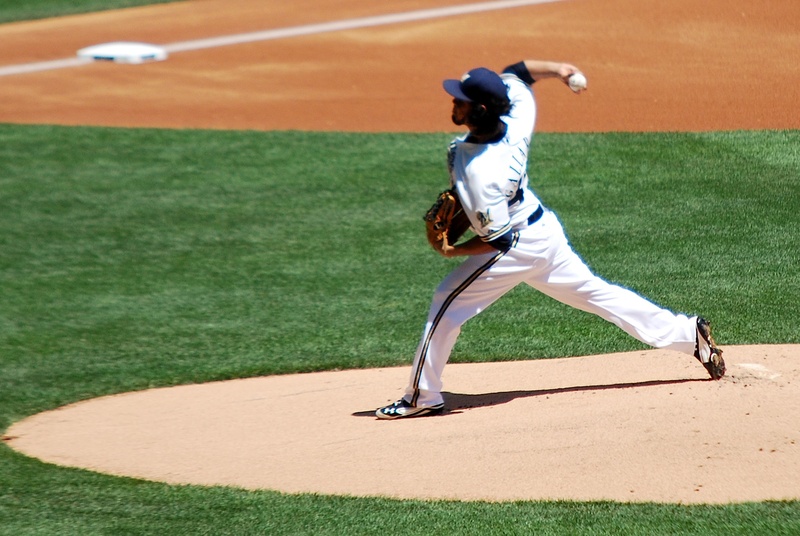 Yovani Gallardo pitched through the seventh inning, and finished the day with this line: 7 innings pitched, 4 hits allowed, 0 walks, 1 run (earned) and FOURTEEN STRIKEOUTS!!! This puts him into a tie for second place in franchise history for most strikeouts in a single game. Justin, who’s birthday tailgate I visited, witnessed Ben Sheets striking out 18 Atlanta Braves back in 2004. Victoria and I left our spot in front of the press box and went to our seats during the seventh inning. I watched the first pitch to McGehee from the bottom of the staircase behind section 221, then tried to climb all the stairs before the next pitch. I failed. I turned around just after the 0-1 pitch hit Maldonado’s glove. It was a foolish mistake and it cost me a chance at setting a new (personal) high mark in consecutive pitches seen. K-Rod came on for the eighth and pitched a 1-2-3 inning, while striking out two. Axford retired three of the four he faced in the ninth inning, and the Brewers won the game and the series. 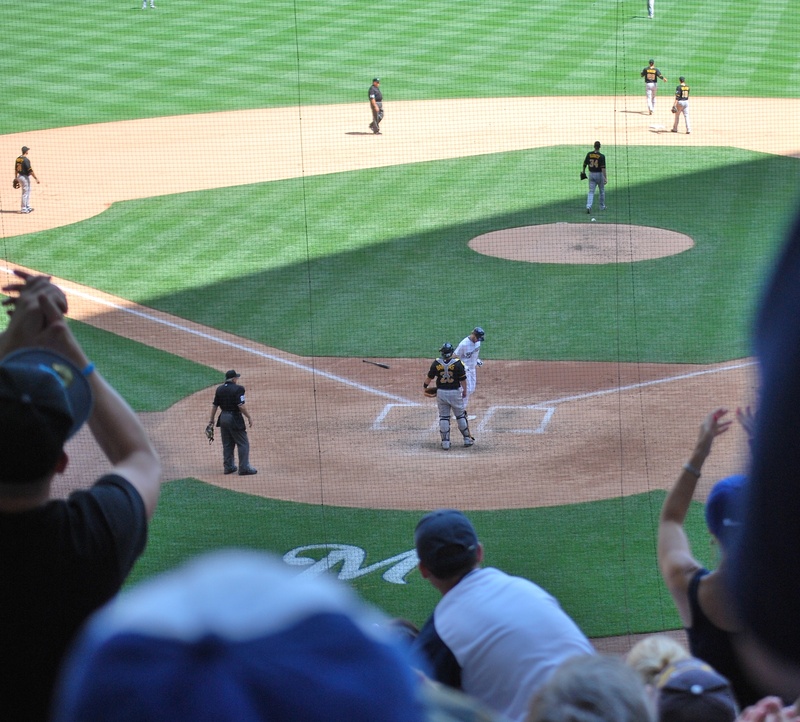 Final Score: Brewers 4 – Pirates 1. Here’s the final pitch of the game. McGehee grounded out to Rickie Weeks to end it. If you look closely you can see the ball hiding behind McGehee’s bat and where the ball had hit the ground (just to the left of McGehee’s left leg). It would’ve been nice to sweep the Pirates, seeing as the deficit would be 5 games rather than the 7 games it is after the 2-1 series win. A series win is still important, though, so I can’t complain. One last picture. 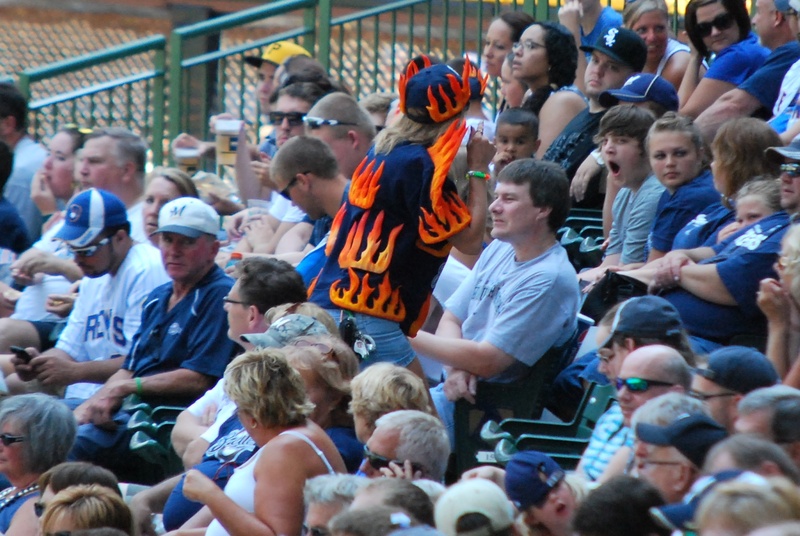 Early in the game Victoria and I had independently spotted a couple of fans dressed like they were on fire. I’m not sure if they made it on TV but it would’ve been a cool lead-in from commercial to let the viewers at home know how uncomfortable it was (at times). I think what you’re doing is great. It has inspired me to become more active than just being on the registry (which i think is great in itself). I have donated what i can and bought a couple of shirts from “Be The Match” to hopefully get other people active as well. What could be better than saving a life through a simple blood donation as many of them are now! I was at this game, but missed many pitches, as i passed out from the heat while walking to get some gatorade. I always look for you at the games we go to! Would love to meet you someday. Thanks again for what you do!! !